Last week, Nintendo showed off its new system, the Switch—an interesting fusion between the company’s long line of massively popular handheld systems and forward-thinking TV-based consoles. With it, Nintendo premiered a bunch of games from its flagship series, including the first evolutionary Mario game since Super Mario Galaxy 2 in 2010. Super Mario Odyssey looks, in some respects, like a traditional Mario game, with the familiar doughy plumber performing acrobatic leaps and bounds in forests, pastel deserts, and other surrealist locales. 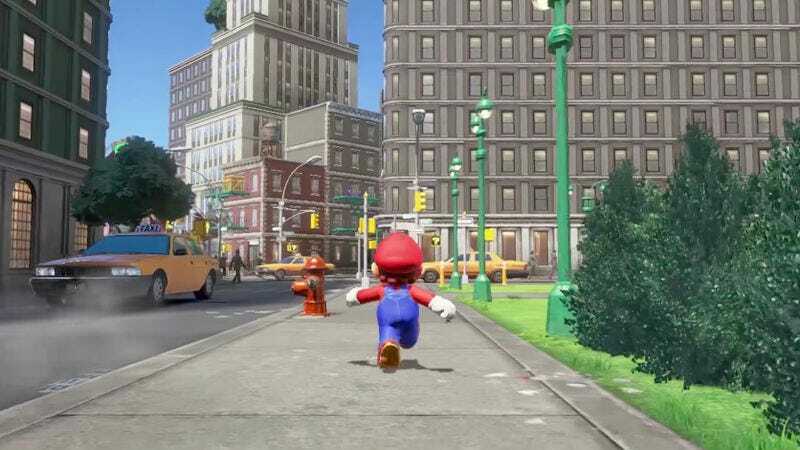 But the trailer also featured footage of Mario in a baffling out-of-sync recreation of New York City, full of taxi cabs, skyscrapers, and, horrifyingly, humans with realistic proportions. Nintendo’s Mario teams almost never make a bad step, but the image of Mario alongside normal-sized humans in a seemingly realistic, open-world environment looks… weird. These New Yorkers are still cartoonish, just less cartoonish than Mario, drawing a weird distinction between realities. The response has been decidedly mixed. Also, they are calling this place New Donk City, which sounds like the name of a Papoose mixtape from 2006. The semi-real New Donk City is wrenched further toward our hellish real world with this short video, which overlays footage from the game with Taxi Driver’s “God’s only man” monologue. It remains to be seen whether or not Nintendo will fully commit to this New Donk grit, entrusting Mario to “plumb” the metaphorical depths of humanity, receiving power-ups not from broken blocks but from broken men on street corners in a gritty pre-Giuliani dystopia, and fighting in vain to save not a Princess but a streetwise young prostitute. That would be the truest Nintendo Switch of them all. Check out the original trailer for the game below.